The sirocco winds originate in the Sahara. As these strong and arid winds cross the mediterranean sea, they pick up moisture and become humid as they cross into the southern parts of Europe. 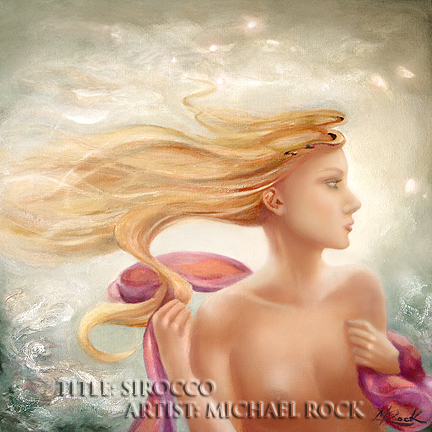 The feeling of these warm winds and the whipping of the seas inspired this painting that I created using oils on canvas. This peaceful scene was inspired while watching the evening sun slowly rest behind a marine layer which was situated between Cambria and San Simeon on the coast of California. 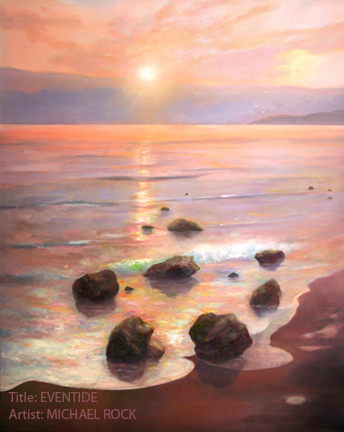 The colors were mostly peaches and lilac which shimmered on the water and the only sounds were from the gentle rolling of the waves upon the sand and the distant seagulls. I painted this scene on a 60 inch by 48 inch canvas which is gallery wrapped. The first layers were made with acrylic paints and then later finished with oils. One of my many passions is to design and build beautiful gardens. I was imagining a beautiful garden… somewhere in the mediterranean with its oversize terracotta pots, an old mossy statue nestled under a grape vine with a big sprawling tree where the morning sunlight would sift through its branches. A semi shaded area with a table set for two awaits invitingly. The only sound coming from a gentle distant waterfall and bird song. I imagined this to be a place of total serenity. The Strawberry Moon appears in the first week of June. As spring turns into summer, the roses bloom and the Elder trees become filled with fragrant blossoms. Elder trees typically like to grow next to streams. Their tiny flowers are buttery in color and they have a honey-sweet aroma. There is sense of magic around this time of year as spring merges into summer, and it was that magical feeling that inspired this fantasy painting created with a symphony of acrylics and oils. The original canvas measures 60 x 48 inches. It is a painting that you feel you can almost walk into. The forest nymph feels protected in her tree as the Strawberry Moon rises into a magical summer sky. This may be the best example of a painting that I envisioned from listening to music. One of my favorite genres of music is classical. Particularly symphonies and fantasias. I find them very inspiring and powerful. There are some pieces of music that really provoke emotions and mental images when I close my eyes to listen. This painting was also influenced from reading ancient mythology in relation to comets. Comet Dreamer Voyage is a celestial fantasy incorporating the ancient mythology of comets, the beauty of a robed spiritual goddess, soaring through heavenly skies among shooting stars, colorful space and sparkling diamonds, flowing through her long golden hair. That first glimpse of the ocean! Remember that feeling of seeing the ocean as a child? One of my favorite places to visit when I was a kid, was Slapton Sands at Torcross. The car ride would take over an hour, passing through several quaint villages, across stone bridges and through miles of winding tree covered narrow lanes before getting my first glimpse of the beckoning sparkling blue ocean peaking through the curved landscape in the distance. “It was a magical feeling”. After visiting one of my favorite places on the California coast where the Eucalyptus trees grow, I decided to incorporate those trees into a fantasy beach scene. I love the smell of these trees and the sounds they make when the breeze blows through them. Their flaking colorful bark alone provides a good enough reason to paint them. In this painting, the trees cast contrasting shadows on the sandy trail which opens up to a mystery beach. Eucalyptus Beach Trail is available in many print options ( including greeting cards) click here. My Grandparent’s garden (which was in Devon England), had a great influence on me when I was a young kid. It was a place filled with rose arches, bird houses, bird baths, wild flowers, shrubs, herbs, vegetables and fruits. I spent a lot of time at play but I also learned a lot. I remember standing under the Elderberry tree in late summer/autumn with an abundance of tempting tiny black berries above me extended from their bright red stems. The taste was very tart and quite inedible but they were fun to pop between my fingers! 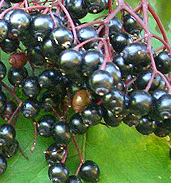 I didn’t know back then that Elderberries could be used to make Elderberry wine! Having sampled some commercial versions of it, I can not enthusiastically recommend it, but an old friend of mine once made his own Elderberry wine from these tiny berries and it tasted very smooth, like a dark Cabernet port. It really was superb. It’s possible to make Elderberry Jam or syrup too. In the early summer, typically around June (depending on the country) those same trees are covered with tiny blossoms. Very fragrant buttery colored flowers extended from stems. The fragrance reminds me of sweet honey. I’m looking forward to gathering these tiny blossoms in June because they can also be made into a variety of things. 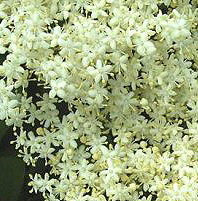 My favorite thing to do with them is to make an Elderflower Cordial. Also, delicious when mixed into pure chilled water with a lemon slice and a sprig of English mint. Perfect and elegant on a summer’s day. These trees or shrubs, like to grow wherever there is a stream or creek. Be cautious before you try picking the flowers because they can be confused with other similar looking flowers that could be poisonous. The Elder tree is sacred to the faeries. It’s told that if you sit under an Elder tree on mid summer’s eve that you may see the fairies. It is therefore advised to never harm or cut one down. Some believed that the tree would provide protection from evil spirits while others believed that the Elder was home to the witch. The Faeries are said to have used the hollowed out wood to make musical instruments. The leaves of the tree are an insect repellent. Sometimes the branches are hung from horses bridals to repel the bugs. I learned as a child not to eat/taste any part of the leaves or branches as they are toxic. For an artist and a foodie like me….. “the cherry is a real feast for the eyes as well as for taste”. In late April, the craggy cherry trees explode with thousands of soft colored blossoms and by mid June, the trees are filled with bright red sweet fruit…. all ready to harvest. The cherry tree is a real feast for the eyes as well as for taste….. so little wonder that they show up in my artworks and my kitchen! My love of cherries prompted me to paint a still life. Firm bright red cherries are contrasted by the softer mellow peaches bathed in a soft light against deep shadows. While walking in a forest of oak trees one day…….. I came to a point where The sun was filtering through the lichen that draped from the branches. It was like being in an enchanted forest. “I remember lichen very well when I was a boy because I used to buy it in packets from the modelling shop while never really knowing where it came from”. There were many legends in Devon regarding the Fay. Stories of the little people. ‘Pixies’ were common in Devon folklore. So, when all of these memories and elements came together, I got to re-creating that photo with the magical feel that I experienced as a young kid, walking through the quiet country Devon lanes steeped in tales of mythical creatures. The Strawberry Moon (or the Rose Moon as is sometimes called in Europe) appears this year on the 4th of June. This month’s full moon gets its name because June’s full moon coincides with the strawberry harvest. When I first discovered the name of this full Moon, it inspired me to paint. I started to think about my palette and so I turned to the colors of crushed fresh strawberries, the green foliage and the creamy white flowers of the strawberry plant. 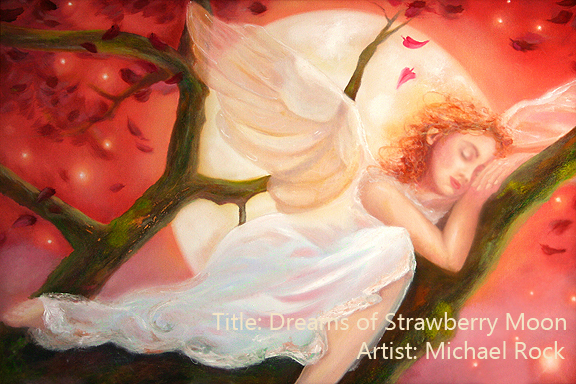 The original oil on canvas of Dreams of Strawberry Moon is available to purchase as well as many print formats including greeting cards here.